5 Diptera Laboratory, Oswaldo Cruz Institute/Fiocruz, Av. Brasil 4365, CEP: 21040- 360, Manguinhos, Rio de Janeiro, Brazil, anthony@ioc.fiocruz.br, jalencar@ioc.fiocruz.br, corresponding author. 6 M. Sc. Graduation Program in Animal biology, Rural Federal University of Rio de Janeiro, Brasil. 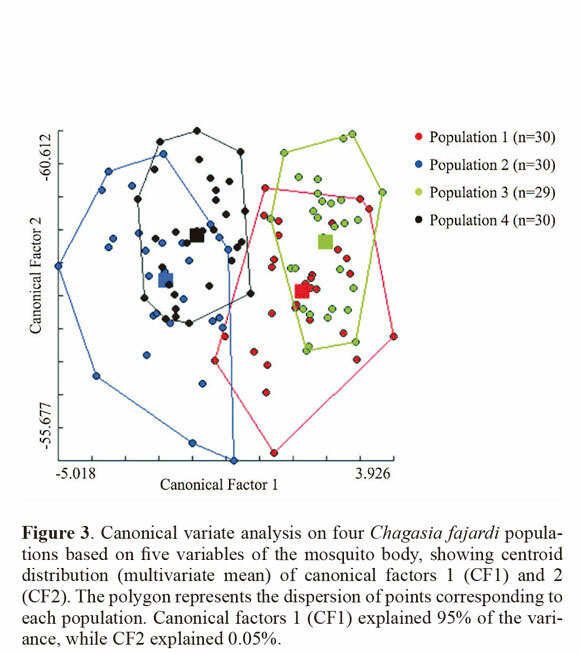 Abstract: The objective of the present study was to evaluate morphological variability in four populations of Chagasia fajardi using classic morphometry. Seven variables of the body were measured in specimens of Ch. fajardi from four biogeographical regions of Brazil, including three populations from the Atlantic Forest biome and one population from the Cerrado biome, were measured. Using analysis of variance (ANOVA), the diagnostic characteristic of the black band on the hindtarsus (Ta-III3) presented strong potential for demonstrating dissimilarity between populations, which were all different from each other. This was followed by the white band on the hindtarsus (Ta-III5) and the wing length (Wl), which showed the presence of two populations similar between themselves, but different from the others. However, multivariate analysis and UPGMA dendograms showed close proximity between populations 2 and 4 and between populations 1 and 3. Morphological variables of Ch. fajardi populations from different regions of Brazil are discussed. Key words: Classic morphometry. ANOVA. Multivariate analyses. Mosquitoes. Resumen: El presente estudio tuvo como objetivo evaluar la variabilidad morfológica en cuatro poblaciones de Chagasia fajardi utilizando morfometría clásica. Se midieron siete variables del cuerpo de los especímenes de cuatro regiones biogeográficas brasileñas, incluyendo tres poblaciones provenientes de los biomas “Mata” Atlán­tica y una población del Cerrado. Usando el análisis de varianza (ANOVA), el carácter diagnóstico banda negra del tarsómero posterior tres (TA-III3) mostró un gran potencial para determinar las diferencias entre poblaciones, las cuales fueron todas distintas unas de las otras. Esto se siguió por la banda blanca del tarso cinco posterior (Ta-III5) y la longitud del ala (WI), que mostraron la presencia de dos poblaciones similares entre sí pero diferentes de las otras poblaciones, siendo estas últimas también diferentes entre sí. Sin embargo, el análisis multivariado y dendrograma UPGMA mostraron la gran proximidad entre las poblaciones 2 y 4, y entre las poblaciones 1 y 3. Se discuten las variables morfológicas de poblaciones pertenecientes a Ch. fajardi de diferentes regiones brasileñas. Palabras clave: Morfometría clásica. ANOVA. Análisis multivariado. Mosquitos. According to Harbach (2007), the subfamily Anophelinae includes 476 formally described species. The traditional classification of this subfamily includes three genera: Anopheles, Bironella and Chagasia. The genus Chagasia Cruz is comprised of five species (Harbach and Howard 2009). The mosquitoes of this genus have morphological characteristics similar to those of the subfamily Culicinae, but are considered to be primitive because of the presence of eight chromosomes (2n = 8), as identified in Chagasia bathana (Dyar, 1928) (Kreutzer 1978). In the other Culicidae, the number of chromosomes is 2n = 6. According to Forattini (2002), the presence of multiple floaters in the eggs is indicative of the existence of an evolutionary process associated with the genus Chagasia, in which an ancestral characteristic from a single pair of chromosomes underwent adaptation, as observed in the anophelines. Baerg & Boreham (1974) demonstrated experimentally that females of Ch. bathana can fed using human blood. There was no evidence of any degree of endophilia, and they were not incriminated as vectors of any pathogenic agent for human beings or domesticated animals (Forattini 2002). These mosquitoes have typically sylvatic behavior and are found in forested environments. They appear to be strictly zoophilic with acrodendrophile tendencies (Galindo and Trapido 1957). Their distribution is restricted to the Neotropical region, and they are usually found in mountainous areas (Causey et al. 1945). The latest compilation of the geographical distribution of Chagasia was presented by Harbach and Howard (2009) and comprises Ch. ablusa Harbach, 2009 (Colombia and Peru); Ch. bonneae Root, 1927 (Bolivia, Brazil, Colombia, Ecuador, French Guiana, Guyana, Peru, Suriname and Venezuela); Ch. fajardi (Lutz, 1904) (Argentina, Bolivia, Brazil, Colombia and Guyana); Ch. rozeboomi Causey, Deane and Deane, 1944 (Brazil); and Ch. bathana (Belize, Colombia, Costa Rica, Ecuador, Honduras, French Guiana, Guatemala, Mexico, Nicaragua, Panama and Venezuela). Morphometric analysis is a useful technique for solving taxonomic problems, such as studying and delimiting populations of the same species, or recognizing cryptic species in sympatric or allopatric populations (Calle et al. 2002). It has also been shown to be useful for correlations with other phylogenetic techniques, such as isoenzyme analysis (Dujardin et al. 2000), and for differentiation of insect populations of medical importance (Dujardin et al. 1997; Dujardin and Slice 2006; Dujardin 2008). There are few papers which show the use of morphometry in Culicidae (Jirakanjanakit et al. 2008; Suman et al. 2009; Morais et al. 2010; Kanojia et al. 2010). Some authors used morphometry successfully to identify some species of the subgenus Anopheles Nyssorhynchus from Colombia and Venezuela, including Delgado and Rubio-Palis (1993), Rubio-Palis (1998, 2000), Calle et al. (2002) and Laurito et al. (2008). In order to assess the phenotypic variability of Ch. fajardi, a comparative study of body size in four Brazilian populations of this species was performed. Insect samples. The four Brazilian female populations used for this study came from the following locations: 1) Bocaina National Park, Municipality of São José do Barreiro, State of São Paulo, between 22º45’S 44º37’ - 44º43’W, which is in the Atlantic Forest biome at an altitude between 1495 and 1642 masl; 2) Corumbá Hydroelectric Plant, Municipality of Caldas Novas, State of Goiás, 17º45’S 48º30’W, which is in the savanna (Cerrado) biome at an altitude of 686 masl; 3) Itatiaia National Park, Municipality of Itatiaia, State of Rio de Janeiro, 22º29’S 44º33’W, in the Atlantic Forest at an altitude of 610 masl; and 4) Iguaçu National Park, Municipality of Foz do Iguaçu, State of Paraná, between 25º 37- 25º40’S 54º26’- 54º28’W, in the Atlantic Forest at an altitude between 180 and 222 masl. (Fig. 1). The females were collected using a manual suction tube (Castro collector) and transferred to plastic bottles with a height 5 cm and diameter 3 cm which contained a layer of cotton wool soaked in paraformol at the bottom, overlain with filter paper. The specimens were taken to the laboratory on the same day. 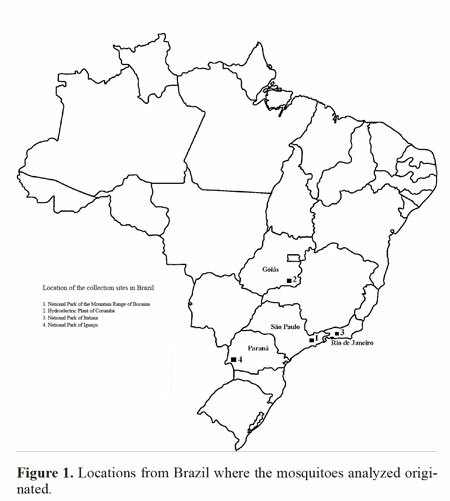 Mosquitoes populations examined were from ecological and epidemiological studies developed by the staff of Laboratório de Diptera do Instituto Oswaldo Cruz - Fiocruz. Populations were collected during the following sampling periods: Bocaina National Park, January 1991 to December 1992; Corumbá Hydroelectric Plant, January 1996 to January 1997; Itatiaia National Park, August 2002 to July 2003; and Iguaçu National Park, January 1995 to November 1996. The mosquitoes were identified at the laboratory using the adult identification keys produced by Causey et al. (1945), Forattini (2002) and Harbach and Howard (2009). The genus and subgenus abbreviations followed the system proposed by Reinert (2001) and the terminology for description used was in accordance with Harbach and Knight (1980). Specimens for reference were deposited in the Entomological Collection of the Oswaldo Cruz Institute (IOC), within the Atlantic Forest Collection and the Cerrado Collection. Measured characteristics. A total of 119 females from the field were examined, including 30 specimens from each locality (except for population 3 with n = 29), and seven variables on the mosquito specimens were measured: 1) the black band on the hindtarsus (Ta-III5); 2) the white band on the hindtarsus (Ta-III5); 3) the black band on the hindtarsus (Ta-III4); 4) the black band on the hindtarsus (Ta-III3); 5) the total length of the hindtarsus (Ta-III); 6) the wing length (Wl); and 7) the proboscis length (P) (Fig. 2). Measurements on these mosquito characteristics were made using a stereoscopic microscope (ZEISS Stemi SV6®) with a 10 X eyepiece and 43 X. A micrometer (100 divisions = 10 mm) was calibrated using a micrometric lamina (0.001 mm). Statistical analysis. The morphometric data were quantitatively analyzed, obtaining the means and standard deviations. In order to check the precision of the data, the precision test (P) was used. The calculation was made from pairs of measurements on 30% of the specimens, which were selected randomly. In order to exclude doubtful variables, the reliability of the data was retested by means of the exactness method (E). The exactness was calculated between the maximum and minimum values of each variable, multiplied by one hundred. The variance of the population was estimated using single-factor analysis of variance (ANOVA). The estimate of the variance was calculated by combining the variances between the samples relating to the modes. The “F” ratio was calculated to indicate how different modes related to the variable in each population studied. The significance of the minimum amplitude was analyzed using the Duncan test. This ANOVA and the “F” region were used to test the hypothesis that the effects from the parameters of the seven diagnostic characteristics were real. The relationships between the central trend measurements proved that all the samples of the four populations had normal distribution and similar variances, and this made it possible to test the variance relating to the mode. The specific differences between the means of the samples coming from the four regions investigated were tested, two at a time, using the “t” test to investigate significance between pairs of mean samples values, with a cutoff of a = 10%. Variables with significant differences were used for a discriminant analysis (Sokal and Sneath 1963; Morrison 1976) between populations. The data from each population were log-transformed to obtain functions that enabled better identification of the study groups. For population analysis, Mahalanobis distances and their statistical significance were calculated using permutation tests (1000 runs each) after Bonferroni correction. Cluster analysis based on Mahalanobis distances was used to build an UPGMA (unweighted pair-group method with arithmetic average) dendogram. The analyses were performed using the PADwin software, version 81a (Dujardin 2003). The means and standard deviations of the descriptive statistics on the seven measured variables in each population are presented in Table 1, with the graduation unit values already converted into millimeters. From these results, population 1 was observed to have the lowest values for the seven variables measured. ANOVA revealed the diagnostic characteristic of the black band on the hindtarsus (Ta-III3) had strong potential to show dissimilarity between the populations. This was followed by the white band on the hindtarsus (Ta-III5) and the wing length (Wl), which showed the two populations ware similar and different from the others, which also differed from each other. The variable black band on the hindtarsus (Ta-III4) showed the greatest similarity among the populations. Using groups of two and three populations, for different sets of variable studied in the populations, it had differences or similarities with regard to the different sets of the tested characteristics (Table 2). Through discriminant analysis, canonical factor 1 (CF1) separated populations 2 and 4 from populations 1 and 3 (Fig. 3). Canonical Factor 1(CF1) explained 95% of the variance while CF2 explained 0.05%. 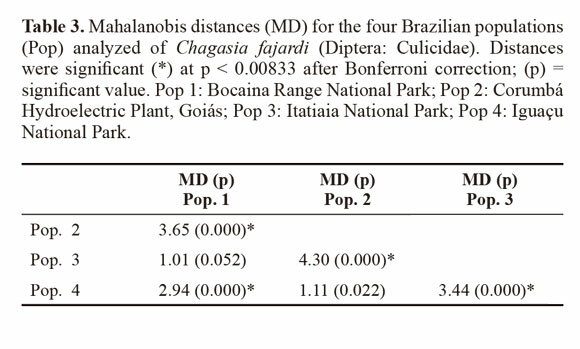 The Mahalanobis distances between the four populations were highly significant (P < 0.001) (Table 3). These distances were used in UPGMA (unweighted pair-group method with arithmetic average) cluster analyses to produce dendrogram. 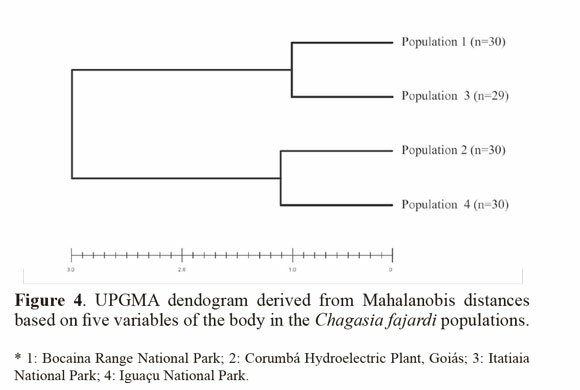 The derived UPGMA dendrogram showed two clearly separated clusters formed by populations 1 and 3 in one position and populations 2 and 4 in another position (Fig 4). After 1000 permutations, 63% of population 1 specimens were correctly reclassified, while population 2, 3 and 4 specimens had reclassification rates of 70%, 68% and 63% respectively (Table 4). 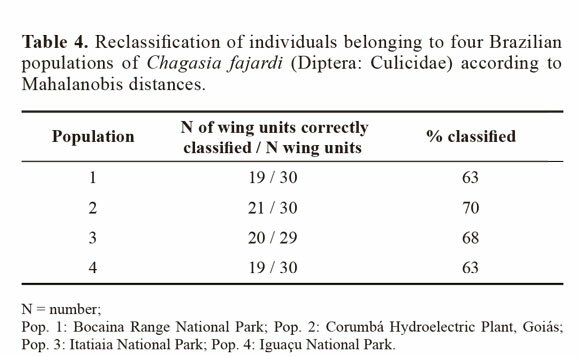 According to Harbach and Howard (2009), Chagasia is a genus with few taxa that forms a homogenous set of species with few morphological distinctions. Molecular data would probably be necessary to elucidate the phylogenetic relationships within the genus. Chagasia ablusa has been erroneously identified as Ch. fajardi, based on the superficial morphological similarities of the adults (Harbach and Howard 2009; Berti et al. 2011). These similarities indicate that Ch. ablusa is morphologically closer to Ch. fajardi than any other species of Chagasia, which is a debatable matter (Harbach and Howard 2009). The structure of the male genitalia and the dark scales in the central area, dorsal face, and distal half of the wings suggest that Ch. ablusa, Ch. fajardi and Ch. rozeboomi are relatively closer to each other than to Ch. bathana and Ch. bonneae (Harbach and Howard 2009). Although Ch. fajardi is considered to be a species without epidemiological importance for disease transmission, and has essentially zoophilic habits, its feeding habits have been observed to be highly eclectic and opportunistic, such that it reacted to all the antiserums analyzed by Alencar et al. (2005) and Silva (2011). Moreover, specimens that were positive for human/primate antiserum were found in all the geographical regions studied (Alencar et al. 2005). In comparison with DNA techniques, morphometry is considered to be an inexpensive tool with rapid results. It has made important contributions towards medical entomology (Dujardin and Slice 2006) and is able to make use of specimens in entomological collections without damaging them (Aytekin et al. 2007).The results showed by Mahalanobis distances suggest morphometric variability exists among populations of Ch. fajardi, thereby showing groupings between populations 1 and 3 and between populations 2 and 4. The discriminant analysis provided satisfactory individual reclassifiction rates as showed by Bouyer et al. (2007) for Diptera (Glossinidae). The phenotypic variability encountered in the populations analyzed may have been influenced in different ecological levels, with the environment being able to influence the rate of reproduction by speeding up or reducing the setting of a happened morphologic modification. The four populations of Ch. fajardi come from four Brazilian states and two different biomes. The population 1 and 3 are geographically closer and correspond to the biome of Mata Atlântica. Population 2 and 4 are from the state of Goiás and Paraná respectively and belong to the cerrado biome. 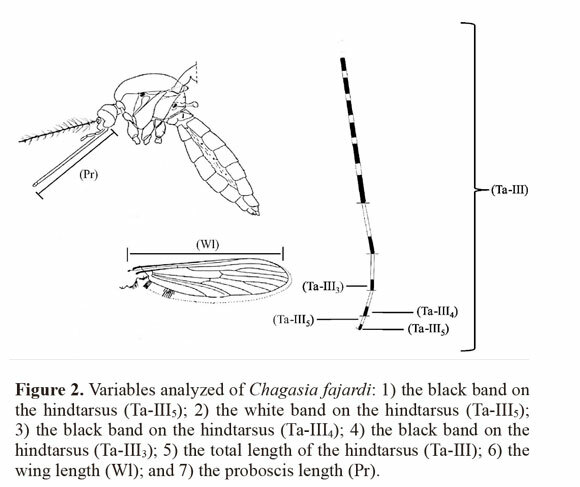 Bidou & Marti (2008) described the geographic and climatic factors related to a body-size cline in insects (Orthoptera: Acrididae). They showed that the variability of body size increases with latitude and altitude in males and females. This could be a hypothesis for morphological variability of Chagasia populations coming from distinct geographical areas. According to Py-Daniel and Fernandes (2005), ecological differentiation may lead to morphological and behavioral differences between the sexes, such as specialization of males and females regarding their intake of different types of foods. However, sexual selection mechanisms are the factors leading to the appearance and fixation of dimorphic sexual characteristics, through females’ choice of males and competition between males, or through males’ choice of females and competition between females (Py-Daniel and Fernandes, 2005). Based on ANOVA, morphological differentiation of Ch. fajardi has been found in allopatric populations, without a defined pattern of modification. The diagnostic characteristic of the black band on the hindtarsus (Ta-III3) is the variable that best defines the differentiation. Causey, Deane and Deane (1945) reported that the species Ch. fajardi and Ch. bathana presented similarity regarding the Ta-III5, with black marking on 1/3 to 1/4 of their extent. According to Harbach and Howard (2009), posterior tarsal segments 2-5 in adult specimens of Ch. ablusa differed from those of Ch. bathana in that they did not present a dark postbasal band. In addition, the length of the apical dark band on the hindtarsus Ta-III2 was different from that of Ch. fajardi in 92%. According to Forattini (2002), modifications to populations can occur in two essential manners. In one of them, the population becomes diversified into two or more groups, each one following its own evolution; in the other, the population becomes progressively differentiated as time goes by (Forattini 2002). The morphometric analysis used in the present study made it possible to show the morphological variability of the populations of Ch. fajardi from four different geographical regions of Brazil. The evidence encountered justifies extending the study to search for other variables and tools for achieving as much discrimination between the adult populations as possible. Morphometric analysis is a technique economically favorable and useful for solving taxonomic problems. However, in order to give further support, our results could be corroborated with other techniques, such as molecular biology techniques.